With just a few hours of driving, you can save up to 70% by going to Mexico for a root canal. The cost of a root canal in Mexico (with a post) is only $320. In the US, the cost is around $1,000 to $1,300. Some of the top root canal destinations in Mexico are within driving distance for many people, including Los Algodones, Tijuana, Nogales, and Juarez. We want to make this experience as smooth as possible for you. That’s what we do here at Dayo Dental. So here are 5 tips we would like you to know before getting a root canal therapy in Mexico. Why? Because this could save you an extra trip to Mexico. In most cases, root canals are completed in one day. If you have a severe infection, the dentist can’t complete the root canal in the same day. A swollen cheek or a “bubble” in your gums is a good sign of infection. When you have a severe infection, the dentist will have a hard time making the dental anesthesia work. Unless you like pain with your dental work, I say wait it out. The dentist can’t also clean the entire tooth root when there is an active infection that compromises the root. If you do go to Mexico with an infection, the Endodontist (root canal specialist) will start the root canal process, open the site, and place medications to let the bacteria subside. You would still get pain relief, but he will ask you to go back to his dental clinic in Mexico after 1 week to finish the root canal procedure. Schedule a consultation with a general dentist first before getting a root canal in Mexico. If you go straight to a root canal specialist, he will likely perform a root canal. After all, that’s what you are scheduled for. But what if you don’t really need a root canal? Here at Dayo Dental, we encounter many patients who have been told they need a root canal by their US dentist or Mexico dentist. During the consultation with the honest general dentist, they are told they only need a crown or filling. That’s a huge difference in cost! Plus you preserve your tooth significantly for the long-term. Some root canal cases are better off with a dental implant. A general dentist in Mexico will also help you decide between opting for a root canal therapy or an extraction and dental implant. Furthermore, the general dentist in Mexico can provide a comprehensive evaluation of your mouth. This will educate you regarding priorities and the steps to get your entire mouth in excellent health. Don’t worry, your root canal appointment will be right after your 40 minute consultation with the general dentist in Mexico. A dental implant replaces the tooth root. Implants are designed to last a lifetime with proper oral health. It’s a well-known dental industry trend that treatments are moving toward dental implants. Dental implants offer a lifetime solution. Maybe that’s why Endodontics is not a popular specialty among US dental students. 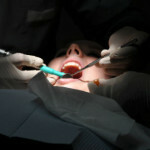 Root canal procedures have unpredictable life spans. It may take 5, 10, 15, or 20 years before you would need another root canal retreatment. After a while, a tooth that has received a root canal may need to be extracted. In this case, the tooth doesn’t have enough good structure to survive another root canal retreatment and a new crown. Hence, you have more potential expenses in the future. In some cases, you are better off with a dental implant. This is one of the reasons why you should see a general dentist in Mexico first before going to an Endodontist. 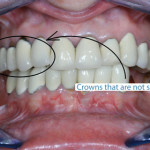 A dental implant with a crown can be 3 times the cost of a root canal and a crown in Mexico. A dental implant also takes more time to complete. Some holistic dentists (also called biological dentist) in Mexico would even totally advise against root canals. They see a root canal as having a dead tooth structure in the mouth. Keep in mind that not all root canal procedures are better off with dental implants. Most dentists will want to preserve your teeth as much as possible. This is an example of a tooth (middle tooth) that just had a root canal. It needs a post and a crown to stabilize the tooth. The adjacent teeth are examples of teeth that have a root canal and post. After a root canal procedure, the tooth will need a root canal post and crown to seal the tooth and strengthen its structure. The tooth is at risk of breaking without a root canal post and dental crown to stabilize it. First, when comparing the cost of a root canal in Mexico, ensure that the price includes the root canal post. A root canal post is installed after a root canal to seal the root area and to strengthen the tooth for the crown. Although less common, some dentists in Mexico exclude the price of the root canal post in your quote. However, root canal specialists in the US typically separate the cost of the root canal post. So a $900 root canal with a US dentist becomes a total of $1200 when you add the root canal post. The average price of a root canal with a post in Mexico is $300 to $400. Some of the best root canal specialists in Mexico charge around $450 to $550. Dr. Pedro Ortiz from Cabo uses an advanced microscope to perform root canals with all his patients. The post procedure x-ray will be your proof that your root canal dentist in Mexico performed your root canal correctly and completely. All the nerves have been removed. All infections were cleaned. The tooth is strong and intact. If there is an issue in the future, you can see another dentist with the x-rays as reference to evaluate the work of your root canal dentist in Mexico. If you need multiple root canals, don’t rush your dentist. Some dentists in Mexico brag that they can do root canals in less than 20 minutes. These dentists are being careless about the process. In their rush, they can break your tooth or provide incomplete treatment. This could result in an extraction. Some top and most expensive Endodontists in Mexico even do microscopic root canals. They use a microscope to extensively and carefully perform the root canal. They take pride in doing the best root canals in Mexico.